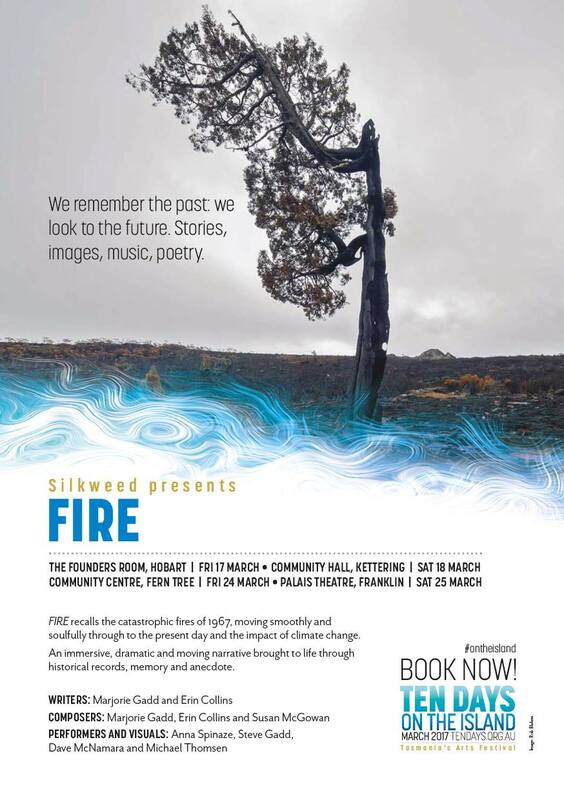 Silkweed artfully performed an evocative musical account on the 50th anniversary of a significant historic Australian disaster. Independent review by Dr Maree-rose Jones, PhD, USYD, A Study of Cultural practice 1827-1857, in Van Diemen's Land. Marjorie Gadd and Erin Collins have woven a garment of stories it feels safe to wear for those who remember the terrifying 1967 Tasmanian bushfires. Its harsh memories sit like stones in the heart of many Tasmanian people, and will do so as lived memory for another fifty to 60 years. "Fire" turns some of these stones, and from the ashes of memory they created a compassionate account, full of pathos and at times highly amusing, witty humour! If ‘sensitive’ can mean demonstrating compassion towards the attitudes, feelings, of local community and its needs, "Fire" and its delivery by Silkweed is remarkably sensitive. No one wants their audience to go home with triggered flashbacks or PTS, but this seems unlikely with "Fire” given the careful balanced approach taken to storytelling and visual curation. It's actually a very healing programme to view. Who would have thought someone could ever make us smile thinking of that soul-destroying day, and soothe us with such well timed sensitive 'musical word painting'? Using a loose musical form slightly simulating a through-composed ballade, Silkweed emotively heightened their delivery in the manner of contemporary bards and troubadors, well actually, troubairitz! Chopin used the term ballade to denote a free form, without indicating too much just what story line he had in mind when composing, but by contrast, Silkweed's text tell us much. In the spirit of Bards' tradition, they poignantly illuminated a course of events, ipso facto, via records, carefully resourced and sensitively collaged, from a range of Tasmanian archival film and photographic sources. The rise and fall of Collins’ plaintive voice led us passionately though Gadd’s true anecdotes, some drawing upon events from her childhood. Huon Valley and Channel snippets featuring dry Australian depreciating humour, draws the audience closer to innate emotion and elucidates significant events, now quickly passing into our cultural history. "Fire" is a fine creative work that befriended us as an audience, to a posh academic whose final copy of a PhD burned page by page in the bushfires a week before submission and had to be written again; a wheelchair bound, legless war veteran supporting a twin toddler on each thigh as he was wheeled through a burnt paddock; cocky Electrona plant worker, who despised being called a "new Australian" literally carrying the people who harangued him with the spiteful name, out of burning houses. Steve Gadd's convincing "Marco" replete with migrant accent and his classic Australian 'knotted hanky' sunhat, raised many smiles amongst the audience. Anyone wanting to know more about the 1967 event, or has heard second hand from those who lost a friend, relative, possessions, land, pets would do well to learn, by buying a ticket and sitting at the foot of our local Tasmanian bards. Silkweed is to be thanked for putting a humane, compassionate spin on a life changing day, and amazingly reminding us with humour, of the fortitude of human spirit in the face of danger. Bravo! Review by Dr Maree-rose Jones, PhD, USYD, A Study of Cultural practice 1827-1857, in Van Diemen's Land.